The German general election of 1998 was fought against the backdrop, not only of increased European integration, but growing pains on the domestic front stemming from the 1990 reunification project. With incumbent centre-right Chancellor, Helmut Kohl campaigning on a continuity mandate, the opposition Social Democrats portrayed themselves as the ‘new centre’. The results saw Europe’s strongest economy vote for change, with Kohl, Germany’s longest-serving Chancellor defeated by an SPD / Green Party coalition, lead by Gerhard Schröder. In Stuttgart-Sindelfingen a similar ideological shift was taking place and while the old order wasn’t quite out on their ear, they were being edged steadily closer to the door. None more so than veteran Mercedes Design Director, Bruno Sacco, the man who had presided over the Swabian carmaker’s stylistic heyday. But by the mid-’90s, the company he helped visually define was finding its previously unassailable position at the automotive pinnacle under growing threat. Sacco, whose ‘vertical affinity’ design ethos had been discredited amid the poor reception accorded to the overwrought W140 S-Class, might still have been in office, but like an embattled politician, he was no longer in power. The loss of influence was palpable, especially following a succession of new models which traded the marque’s former timeless appeal for something more ephemeral. With the lower orders of the model range renewed, it was the turn of the flagship Sonderklasse to receive the new dressed-down aesthetic, courtesy of Sindelfingen’s favoured sons, Peter Pfeiffer and Autocar’s 1997 ‘Designer of the Year’, Steve Mattin; the Briton fresh from the triumph of the previous year’s A-Class. Like the German government, whose outgoing leader personified an era which clarified Germany’s pre eminent economic status within Europe, and presided over German unification, the W140 marked the closing of a chapter. A vehicle which lest we forget, Car magazine once described in the following terms. “The S-Class reeks of quality – quality of every kind, a quality which runs to the very core of its soul.” Somewhat po-faced it might have appeared, but from its fin de siècle aesthetic to its cost-no-object engineering ethos, the ‘140 was every last centimetre the patrician Swabian flagship. The W220 S-Class, introduced that August, symbolised a formal shift in both look and feel. Seemingly built on a modified W140 platform, the W220 was slightly more compact externally, but maintained the outgoing car’s generous cabin dimensions. A great deal of effort was expended in reducing the visual heft of what was still a very large vehicle, with most critics lauding Mercedes’ design team for leavening what had been widely criticised as being an S-Class too far. However, most of the car’s visual lightness stemmed from the 220’s styling scheme, which eschewed the ‘140’s lineal form language for something a good deal more curvaceous. Also aiding the visual illusion was the lower, ‘faster’ roofline, pronounced taper towards the rear of the vehicle, not to mention the distinct sculpting of the bodysides. 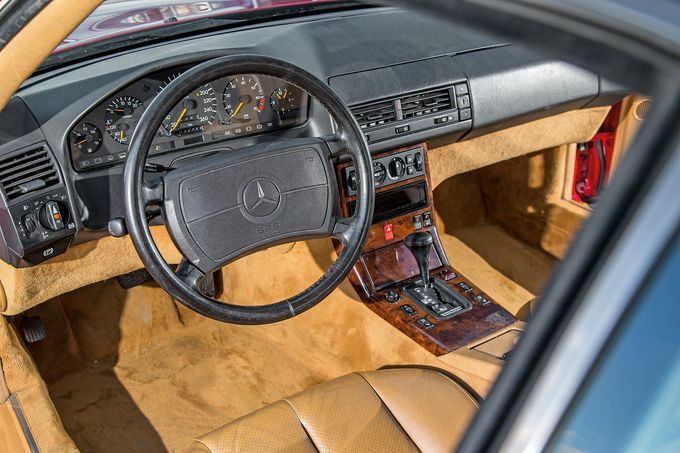 This informality was also carried into the W220’s cabin, where the dashboard, in an ill-advised reflection of the entry-level A-Class, was designed to a similar undulating theme. The standard-fit and liberally applied eucalyptus wood finish did little to raise the tone either, appearing cheap-looking and in typical Mercedes-Benz fashion, somewhat ersatz. Burr walnut, elm and maple finishes were however also available. But while the W220 presented a less formal proposition, one which seemed to chime with the immediate pre-milennium period, its studied lack of gravitas ensured it dated quickly and aged poorly. Its position at the pinnacle of the Swabian ziggurat wasn’t aided by the 2000 announcement of the W203 C-Class, a car which appeared for all the world as a shrunken carbon-copy, a pratfall its predecessors had hitherto avoided. 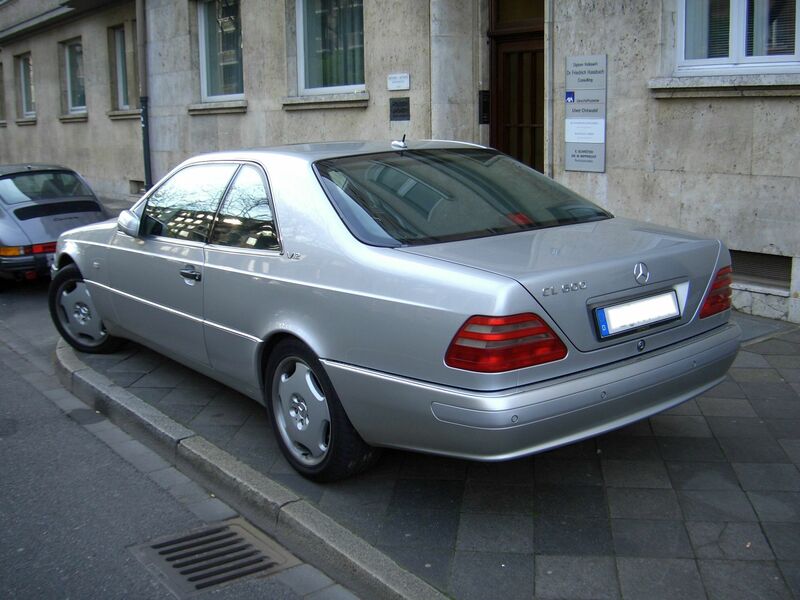 Despite being the habitual technological tour de force, the W220 also was the first S-Class to suffer significant durability issues, partly owing to the sheer amount of electronics controlling so many aspects of the vehicle’s functionality and its advent amidst Daimler-Benz’s “anni horribili” when it came to matters of build integrity. The W220 marked a new era for Mercedes. One where the advent of a new Sonderklasse was no longer marked by a breathless sense of wonder. 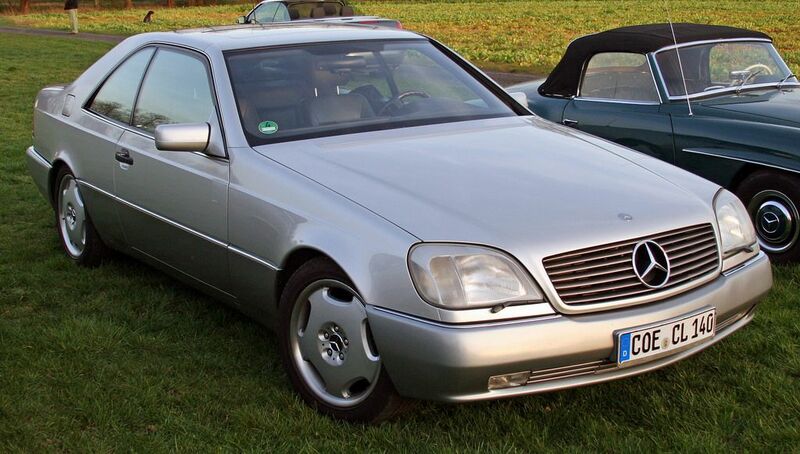 Following this iteration, the S-Class became like everything else – predictable, slightly mundane, somewhat throwaway. And while enthusiasts continue to revere the W126, fervently debate the merits of the W140, few apart from true believers even recall the W220. A car which appeared to enjoy a mayfly’s career in Benz terms and has since faded without trace. Everybody can remember former Chancellor, Helmut Kohl – after all, giants tend to live long in the memory. But Gerhard Schrōder? I had to look him up. But unlike the S-Class which coincided with his reign, his time at the top was comparatively short-lived, while in the W220’s case, it simply looks that way. Maybe Gerhard Schroeder is largely forgotten in Ireland, but in mainland Germany he and his political heritage are all too well remembered and they’re the reason for the dangerous situation of German Social Democrats. Schroeder did the same as Blair did in the UK, entering the hot seat on a left wing party ticket and delivering pure neoliberalism, thereby cheating on their traditional customer base. Blairified Labour is suffering the same fate as Schroederised Social Democrats rightfully do. This is in analogy to what Mercedes did in the Schrempp era – maybe they need a Corbyn equivalent to find back to their roots. The W220’s biggest problem was its wide spread use of materials of very shoddy quality that would have been unthinkable in any Benz before it, let alone an S-class. Someone had to pay for Schrempp’s misguided experiments with DaimlerChrysler that in the end cost eighty billion Deutschmarks – in cash, not in market capitalisation. Mercedes workers paid for it in form of salary cuts, customers paid for it in form of shoddy products at exaggerated prices and Schrempp got a three figure millon severange payment to finally quit the company and stop throwing money out of the window. Britain can keep Corbyn to herself, thanks very much. However, regarding the car, we’re very much in agreement. I still vividly remember being driven around Manhattan in a black W220 S420 Lang in ’99, which was the one occasion to almost make me feel like some sort of celebrity: The S was still quite new and rare on the streets of New York City then, which is why we (or rather: the car) received quite a few admiring glances and knowing nods. And yet I couldn’t help but perceive how this Benz felt rather flimsy in comparison to the E38 Seven series that was part of the family fleet, back in the day. The S-class was superbly comfortable, but had the flair of a very posh ’90s Opel (sorry Richard! ), rather than a staunch, sober air of solidity that used to be the Swabian domain. Thanks to Eoin, I was put in mind of that diabolical eucalyptus wood (and learned that they also applied it onto the arm rest – why on Earth? ), which was only superseded by the hilarious granite veneer (four figure) option in the awfulness stakes. The latter in particular illustrated how Daimler-Benz had changed up to and during the transition into DaimlerChrysler, for it was an expensive extra with no tangible added value (not to mention its highly dubious aesthetic (de)merits). In my book, the granite veneer was supposed to cater to the modern equivalent of the kind of customer who would have optioned the velour option one or two decades prior. Theoretically. Having talked to quite a few MB enthusiasts here in Germany, I can report that early 220s find little favour indeed. Only when the model was facelifted (or: received its ‘Mopf’) did quality reach acceptable levels. While I’m quite obviously no fan of the car, I find it somewhat regrettable that some excellent proportions are buried underneath the mediocrity of the W220. For ignoring the contrived detailing and busy surfacing reveals a basic body shape of considerable grace – which turned out to be the last of its (rear wheel driven) kind*. More’s the pity. Kris, I had always put the W220 as a ‘one to avoid’ list as a possible used car purchase, but if the facelifted one was of a higher quality maybe there is an opportunity here? This is all rather relative, but the facelifted cars are unquestionably considerably superior to early examples, in terms of both perceived and actual quality. Whatever that may actually mean. I would never describe the W140 as ‘overwrought’. I seem to remember its sheer scale caused something of a reaction at launch, but if anything it was too simplistic and plain, failing to disguise the enormous amount of metal encasing the body. I had also thought that the W220 was quite different underneath and not a modified version of the same platform. I may be wrong on that. My recollection was that the Maybach was based on the bones of the W140 because it required such a large frame. I also thought W220’s chassis was all-new, whereas the ‘bach’s was indeed W140-based. But I may be wrong about that. P.S. There is a sub article to be written here about the ashtray. For a moment I thought that entire panel at the bottom of the centre console was a push-action ashtray… but on second view it appears it is in fact the much meaner compartment ahead of the gear lever panel. The only truly Mercedes-like element of W220’s cabin is the way the carpet is distributed inside the footwell. The rest of it (including the horrid gauges) would be to Mercedes what the Porsche 996’s cabin is to Porsche, if there wasn’t the original A-class, whose cabin’s awfulness still beggars belief. That was a missed opportunity on M-B’s side. Kris: can you elaborate on the point about the carpet. It strikes a chord with me because of corresponding treatment of the Omega’s footwell. W220 went mainstream as far as the centre console is concerned, but still featured the fully carpeted footwell. I would argue that the W140, not the W126, was the pinnacle of the S-Class series in engineering and (controversially?) design terms, although it was probably the wrong car for its time, forcefully formal when informality was increasingly in vogue. Germany had Schroder, we had Blair, jacket off, sleeves rolled up, governing from his sofa. The W140 was the last truly engineering led Mercedes-Benz and, to these eyes, it has aged much better than any of its rather ersatz successors. Sadly, I don’t think we will see its like again. The W140 had a number of features that were there just for the sake of it. Door bins were hinged at the bottom, swung out of the door cladding and had a lid that closed automatically once the bins were pushed back. The rear wings sported aiming pins that extended when reverse gear was engaged (German press likened it to the car having an erection) to make the rear corners visible from the driver’s seat (these pins were even lengthened by two inches shortly after production started because shorter drivers couldn’t see the original version). These things all were gone after the first minor face lift. The W140 was blamed for being too tall and too wide – the latter in particular as it didn’t fit the car transport wagons of German railways. This was particularly annoying because in order to get the car to the isle of Sylt, a favourite holiday destination of German wealthy and rich, it had to (and could not) be transported by railway. That is a shameless rip-off of Rolls-Royce´s entrant in the market. It looks like a Chinese clone. I would have thought the Russian Ministry of State Limousines might have done some more homework and perhaps hired a design consultant (less shameful than hiring a photocopier, I´d have thought). Interesting video showing some more detail on Putin’s newest toy. From the thick orange cables seen, looks to be a hybrid. The W-220 must have been designed by a team of people who were educated in the middle 80s. I wonder what it was in their education that led to the 220’s style. What part did the design of 1991-1995 influence them? What about the same generation coupé, the CL ? Probably suffering from the same shortcomings, but to my eyes, very elegant. I’m specially fond of the C-pillar treatment. That was a beast. I must admit I don´t hate it at all. The one thing which stands out with the W-140 was the excessive severity of the interior. I can´t have my cake and eat it though as the design was supposed to underline corporate responsibility as does the Toyota Century interior. Hi, pjrebordao, you mean this? Like the saloon, I think it has aged well. Yes, that´s the one. With the V12 option. A nice little car for shopping trips around town. It´s a pity about the seam under the front lamp though. Was that really necessary? Daniel, the original Ford Focus had a C pillar that narrowed towards its base, as I think did the original Ford Ka. Those odd angles were one of the aspects of Ford’s New Edge design. Yes that’s the one (the first). Nowadays i find it quite tempting. 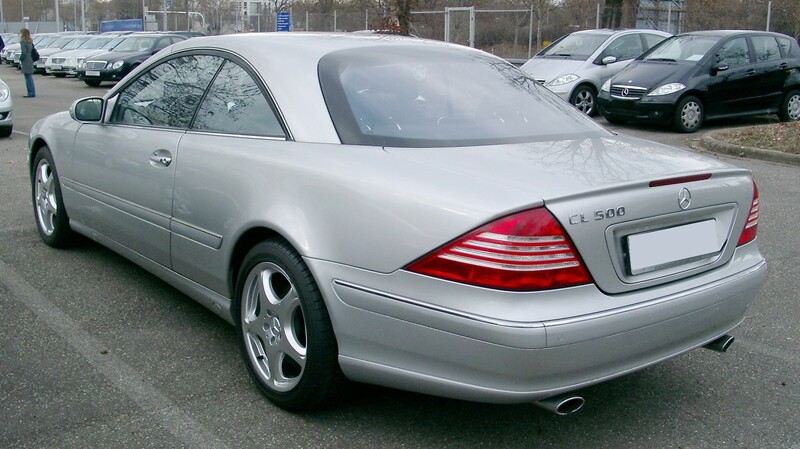 Those cl500’s are getting affordable although with high mileages… But i cringe to think of maintenance expenses or maybe not. Could it be that by now all the troublesome parts have been replaced ? I’m going to go against the DTW tide here and admit a soft spot for the exterior styling of the W220. I much prefer the look of it to either the W140 that preceded it or the W221 that succeeded it. Although I can see that both those designs have more visual presence, I just think the W220 is prettier. Perhaps “pretty” is an adjective that should never be used in association with an S-class. I understand why people like it, but I never thought the W140 matched the looks of the W201, W124 and R129. It took forever to arrive and when it did it was too slab-sided and too heavyweight. The W220 was clearly a reaction against that, but they probably went too far in the other direction. As an aside, the lifespan of each S-class generation has got a lot shorter in recent years, hasn’t it. It’s almost as if they don’t make them like they used to and people aren’t paying attention like they used to. Very likely, and they want to encourage people to trade them in for a shiny, new one more frequently. It would be very embarrassing for any CEO to be seen in an outdated S-Class: the company must be on the rocks! The 220 would be fine from another brand. From Mercedes it feels wrong. I like Japanese design from the Japanese. The 220 is almost Toyota in its form. Good spot, John. Actually, lots of hatchbacks, particularly three-door versions (e.g. Corsa) have this detail. I was thinking more about saloons and coupés and should have mentioned that. Richard, as ever, I am in awe of your eye for detail! In similar vein, is it just me, or is there something not quite right about the arrangement of the rear lights and bootlid? The thin strip of bodywork that separates these two elements seems to emphasise the narrowness of the bootlid. On the other hand, having the light completely surrounded by the wing without any seam looks expensive and properly “coachbuilt”, unlike that rogue seam you spotted under the headlamp. and there’s a seam under the rear lamp. What’s that doing there? On the one side they have the body-colour metal between the lamp and the boot and then under the lamp, a seam. Even if that part was not stampable without a join there they could have filled it. The cost of the car was already huge. And yes, the way the metal separates the lamp and boot aperture makes for a smaller boot. The obvious solution was to have the lamp meet the boot. So, why didn´t they do that as it would have made a bigger boot opening for the golf clubs this car was made to carry to Sylt. Argh! Missed that one too! Must book an appointment with my optician. Daniel: hmmm. I now see that another step is required because as John T (still barred until Christmas) points out it’s now a W-124. I’ll get out my moron photo-editor and see what I can do. That’s the obvious fix (no offence), but does it then just become the rear of a W124? You’re right, John, but that’s not necessarily a bad thing. I was just curious to see if a simpler solution for the taillights might actually be better looking than the original. If my photo editing skills weren’t so rudimentary, I might have changed the bootlid shut lines to be closer to vertical (but still angled) to widen the opening and make the lid look less pinched. Daniel: Tapering C-pillars? 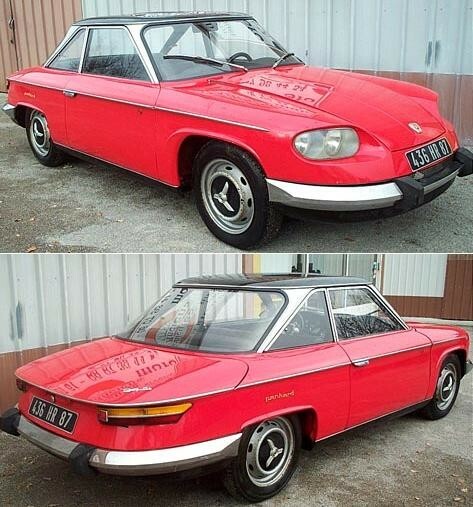 Check out the Borgward P100. I’d post a picture, but I’m presently on The Poor Man’s Sylt and available technology is limited. There is also the 1963 Mercury Monterey. The pillars are narrower at the base than at the top. I think it´s counterintuitive and rather wonderful. The Breezeway Mercuries were preceded by similarly designed Lincolns (Continentals actually). Closer to the w215 CL Mercedes’ slightly funky roof profile, I think are the 1965-66 Dodge Monaco and Plymouth Fury hardtop coupes. But the source inspiration (and for the Panhard’s roofline as well) likely was the seminally elegant 1963 w113 “pagoda”. Tapering C/D-pillars can also be found on all version of the Citroën Ami – estate included. Gentlemen*, I bow before your truly encyclopædic**knowledge of C-pillars. * Safe assumption, I would think, otherwise I apologise for my unintended sexism. ** I make no apology for using the classical spelling. We must maintain appropriate standards on DTW.